The world wide web, the brainchild of Tim Berners-Lee is 20 years old today. The worldwide web isn't to be confused with the Internet, even though they're commonly considered the same thing. The Internet, which is the physical infrastructure of servers and the protocols that enable them to interconnect has been around for much longer. The worldwide web (commonly known as WWW or W3) is a set of protocols for displaying and sharing documents across the Internet. Tim Berners-Lee created a system of "hyperlinking" documents that could then be viewed in a "browser". Berners-Lee successfully married the Internet to his new hypertext in way that made it simple for people around the world to create and share documents and images. This gave us two technologies that we now take for granted they're used so commonly. Hypertext Transfer Protocol (HTTP) and Hypertext Markup Language (HTML). Last year Berners-Lee admitted that he could have designed the system so that the, often annoying, double forwards slash at the beginning of web addresses weren't actually required but, alas, it was too late to do anything about it now. 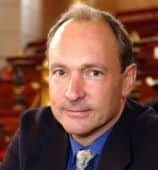 Berners-Lee himself was born in 1955 and is a British physicist and computer scientist. He still oversees the worldwide web today as the director of the world wide web consortium (W3C). He grew up in London and studied at Queens College, Oxford. It was while working at the physics laboratory CERN that he proposed the world wide web. He was knighted in 2003. Today, many people consider the worldwide web as creaking, and desperately needing updating to allow for better and faster communication and sharing online. However it is so established now that making anything to replace it, and actually getting that technology established worldwide could prove impossible, It is clear that the worldwide web infrastructure and protocols will continue to be used until it is absolutely necessary that they be replaced. Wow! So its finally 20 years since WWW came to us.Really can’t imagine what our world would have been without WWW.